Dunbar and Boardman: Spotlight on Innovation: What is Lightspeed Technology? In August Peter and Vance travelled to Amsterdam to meet with a company that has patented a Lightspeed Technology system. The system works by sending light through a fibreglass cable. This cable functions as an optical conductor. A light is received at the end of the cable and is compared to the signal that was originally transmitted. From this point, deformation or bending of the cable will be detected by the transmitter / receiver module and several actions can be programmed into the software. The company behind Lightspeed technology are called Lightspeed Lift Solutions. What are the benefits of Lightspeed Technology? 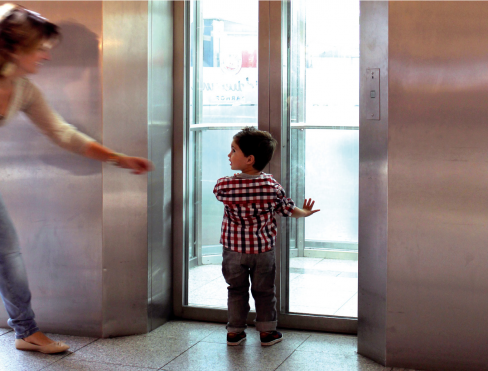 The system can detect whether an obstacle has come into space occupied by the lift door and doorframe. This could be a lift passenger’s hand, for example. Depending on how the system has been set up the lift could immediately stop or open slowly. This is a great additional safety feature for a company’s vertical transportation. When the Lightspeed system is incorporated into the floor of the lift car it can recognise whether there is someone inside the lift and how much of the floor space is remaining. This has great potential in hospitals where it as been applied to the vertical transportation of hospital beds. There is also potential for this feature in high rise buildings and supermarkets. With the LightSpeed optical detection system integrated into the floor you do not even need to manually push a button to call a lift. The system reacts when someone stands on the tile. Once again a number of next actions can be set up from that point. This has great benefits when used in care homes or hospitals but also in shopping centres, industrial environments and for car lifts. Lightspeed have a CS2 Call system that is operated via a RVS touch pad. The touchpad can be used to call the lift. Even if vandals manage to damage the touch pad it will still function. Part of the Lightspeed system can be incorporated in a rubber mat or applied to the floor to secure the cabin roof and lift pit. In practical terms this means that if a person is on top of lift - ‘lift surfing’ they will be detected by the system. Once again a number of desired next steps can be incorporated into the system to enhance safety. This is a great feature to have at your disposal during maintenance and inspections. Dunbar and Boardman keep a watching brief on technological advances within the vertical transportation industry to better serve our clients. Dunbar and Boardman is the lift, escalator and access equipment consultancy. Do you have a current or planned project that would benefit from using Lightspeed Technology? We would be happy to discuss any such requirements and how we may be able to assist. Give us a call on T +44 (0) 20 7739 5093 or send us an email via peterboardman@dunbarboardman.com to start the conversation. We look forward to hearing from you. To find out more about Lightspeed Technology visit the website of Lightspeed Lift Solutions.